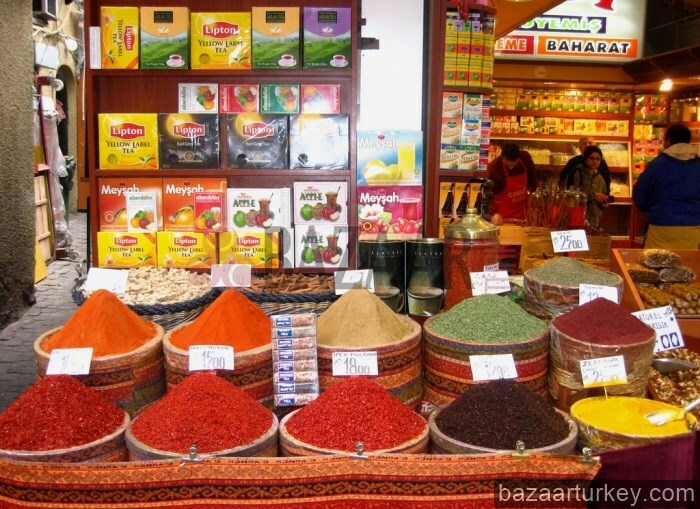 It this workshop, you will learn how to make Turkish Coffe - Turkish Tea and you will make a sightseeing tour in the Spice Market - Local Food Market and Eminonu Area . We will pick you up from your hotel ( For Central City Hotels ) and after that we will come to Eminonu Area to our Coffe shop, we will give you some information about the culture and Turkish Tea - Coffe after that we will roast the coffe beans together and make the Turkish Coffe and Turkish Tea in our store.. Once they are ready, we will taste them along with some sweets.. Upon request, our waiter can give you a short Turkish Coffe Fortune telling as well.. After tasting we will give you some turkish coffe and small gifts in a package. 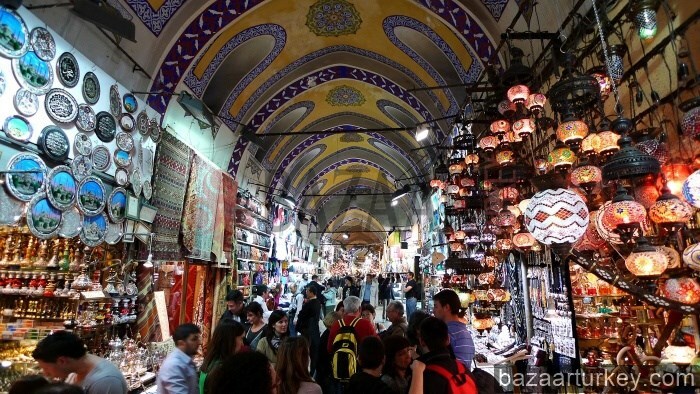 Then we will go to Spice bazaar and other local shops for sightseeing . Upon request, we can visit the historical Rustempasa mosque as well..
Brought to Istanbul in 1555 by two Syrian traders, coffee became known as the "milk of chess players and thinkers". 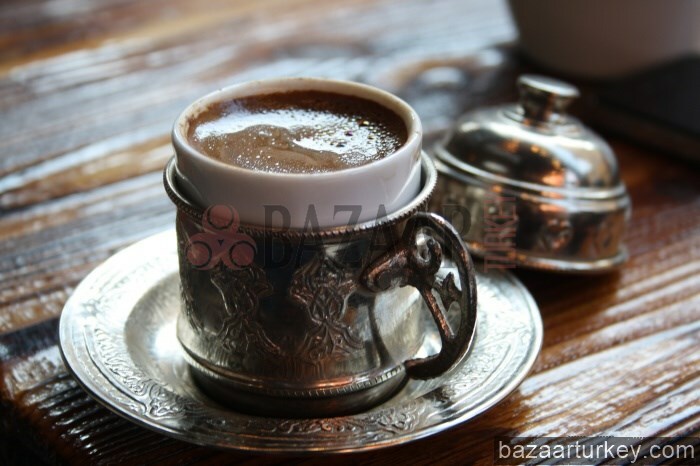 By the mid-17th century, Turkish coffee became part of elaborate ceremonies involving the Ottoman court. Coffee makers (kahveci usta), with the help of over forty assistants, ceremoniously prepared and served coffee for the sultan. Betrothal customs and gender roles also became defined through coffee rituals. In ancient times, women received intensive training in the harem on the proper technique of preparing Turkish coffee. Perspective husbands would judge a woman's merits based on the taste of her coffee. Today, Turkish coffee houses continue their role in society as a meeting place for both the cultured citizen and the inquisitive traveler. Istanbul offers many new and delightful cafe - restaurants where friends and family meet to discuss topics of the day over a cup of traditional Turkish coffee. Turkish coffee is served hot from a special coffee pot called "cezve". Tradition states that after the guest has consumed the coffee and the cup is turned upside down on the saucer and allowed to cool, the hostess then performs a fortune reading from the coffee grounds remaining in the cup. Rich in tradition and flavor, Turkish coffee remains a favorite today. Most people in the world have heard of Turkish coffee, but far fewer have ever tasted it. Europe acquired the coffee habit from the Turks, and adapted it to their own tastes over subsequent centuries, Then the Turks borrowed percolated and instant coffee, so that two very different coffee drinking concepts now exist side by side in Turkey. Traditional Turkish coffee is a culture apart, with its own methods of preparation and serving. 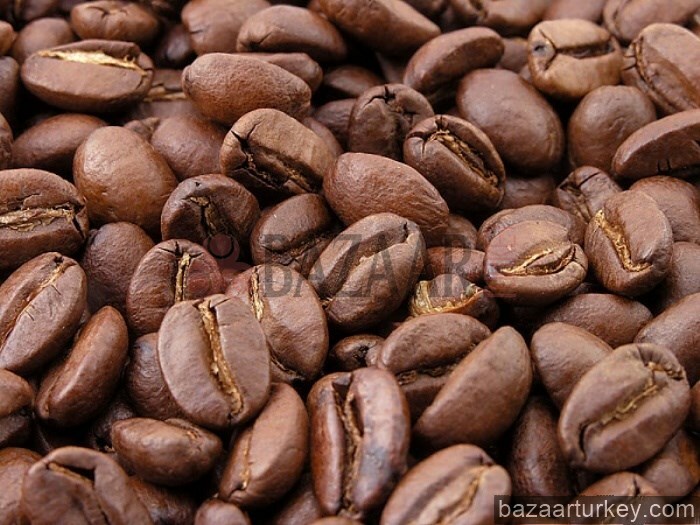 Although the Turks brought coffee drinking to a fine art, the beans were known earlier in Arabia, Egypt and India. The word coffee derives from the Turkish kahve, which in turn comes from the Arabic kahwa, thought to be based on Kaffa, the region in Ethiopia where the coffee plant was originally discovered. In those early day the beans were pounded to a paste and eaten with bread. Two different stories attribute the introduction of coffee into Turkey either to two Syrians named Hukm and Sems in 1555, or to Ozdemir Pasa, Ottoman governor of Ethiopia during the reign of Suleyman the Magnificent (1520-1566). The first coffee house in Istanbul, which was situated in the district known as Tahtakale behind the Spice Market, was soon attracting not only enthusiastic customers, but the unwelcome attention of theologians and clerics, who considered this strange new substance to be a harmful narcotic. To stem the tide of the new craze they forbade it on the grounds that consuming substances made black by roasting was sinful. Ships carrying loads of coffee are said to have been sunk in Istanbul harbour. Yet despite all these measures coffee drinking spread like wildfire, and by the reign of Murat III (1574-1595) there were over six hundred coffee houses in Istanbul alone. Coffee houses were generally constructed in the form of pavilions commanding an attractive view, and most had verandas and sometimes an ornamental pool in the centre. Low platforms for customers to sit upon surrounded the interior walls. Water pipes or the long slender pipes known as cubuk were also provided. Fashionable Turkish coffee houses served as gentlemen's clubs, whose members discussed literature and listened to music and as such are regarded as the forerunners of the Paris cafes. The wide variety of often beautifully decorated equipment used for roasting, grinding, preparing and serving Turkish coffee could fill a museum on their own. The coffee is boiled in long handled coffee pots known as cevze, which have their own distinctive shape, as do the tiny coffee cups. In the past Turkish coffee cups had no handles, and were put in beautiful filigree or jewelled holders. Even the coffee trays are specially designed for the purpose, having an arched handle by which the tray is suspended. Porcelain coffee cups were produced at the iznik or Kutahya potteries, for the Turkish market. Sets of Turkish coffee cups were subsequently produced for local European markets and known as "a la turque" coffee sets. Carved wooden containers for cooling the roasted coffee beans and others for storing them were once part of the equipment in every household, as were the decorated wooden coffee grinders made in Istanbul. Connoisseurs expected their coffee to be heated slowly over charcoal embers for 15 to 20 minutes, the copper coffee pot being frequently taken away from the fire to prevent overheating. One strict condition still observed is that a layer of froth should cover the cup. A heaping coffee spoon plus sugar to taste is allowed for each cup as a general rule today, although in the past most Turks drank their coffee without any sugar. Instead, it was customary to eat or drink something sweet either before or after the coffee, perhaps sweetened fruit juices known as sherbet, fruit conserves, Turkish delight or other confectionery. Another custom which has died out today is the addition of some fragrant substance such as jasmine, ambergris, cloves or coriander. The entire process of coffee making was ceremonial, from the roasting to the protocol of serving guests. For centuries coffee epitomised hospitality and respect for visitors. Even today, when a boy's family visits the home of a girl to ask for her hand in marriage, the girl prepares and serves the coffee, as an indication to her prospective in-laws of her domestic skills. Reading the coffee grinds is a favourite pastime particularly amongst women. The empty cup is turned upside down in the saucer, and left for a while. Then the expert at fortune-telling in the group examines the patterns formed inside the cup and on the saucer. This custom still survives in all the countries of the former Ottoman Empire including Bulgaria, Greece, Egypt, Macedonia and Bosnia. So long as it is drunk in moderation, Turkish coffee is not harmful to the health, but on the contrary, has a calming and restful effect. There is 50 mg of caffein per cup, and this is expelled immediately without accumulating in the body, so in this respect the Turkish coffee cup is ideally proportioned. In larger quantities Turkish coffee is a stimulant. It also aids in digestion, and this is a factor in preventing excessive weight gain. The flavour and aroma of well prepared Turkish coffee is an experience not to be missed in the land where coffee was never cultivated, but first became a specialised endeavour. 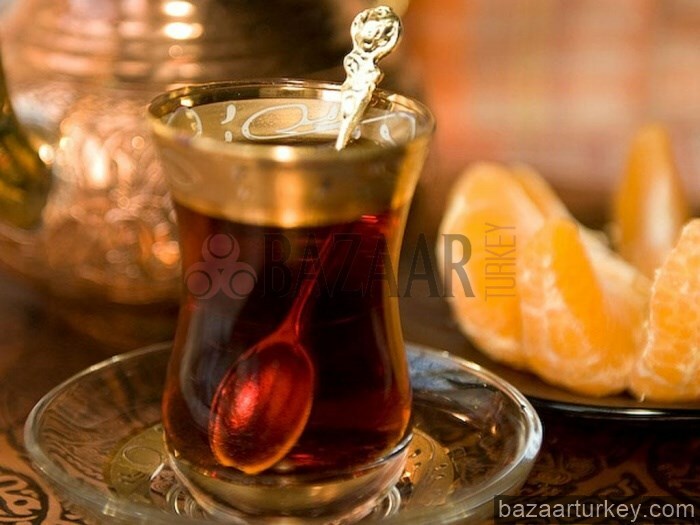 Turkish tea, called çay (pronounced Chai), is normally Rize tea, a variant of black tea which is consumed without milk, is produced on the eastern Black Sea coast, which has a mild climate with high precipitation and fertile soil. Turkish tea is typically prepared using two stacked kettles called "çaydanlık" specially designed for tea preparation. Water is brought to a boil in the larger lower kettle and then some of the water is used to fill the smaller kettle on top and steep (infuse) several spoons of loose tea leaves, producing a very strong tea. When served, the remaining water is used to dilute the tea on an individual basis, giving each consumer the choice between strong (Turkish: koyu; literally "dark", tavşan kanı (literally: rabbit's blood) -- a deep brownish red or weak (Turkish: açık; literally "light"). Tea is drunk from small glasses to enjoy it hot in addition to showing its colour, with cubes of beet sugar. Although tea passed through Turkey as part of the Silk Road trade in the 1500s, it did not begin to become a part of daily life until nearly four centuries later. In 1878 Mehmet Izzet, the then governor of Adana, published the Çay Risalesi (Tea Pamphlet), touting the health benefits of drinking tea. Although coffee was still the preferred hot beverage during this period, tea consumption began to spread as tea houses opened in the Sultanahmet area of Istanbul. Also, tea became a cheaper alternative to coffee; four glasses of tea could be purchased for the price of one cup of Turkish coffee. Today, Turks have one of the highest per capita consumption rates of tea, averaging about 1,000 cups per year. This high rate owes itself to the availability of places to consume tea, social customs and traditions, and domestic production along the Eastern Black Sea coast. 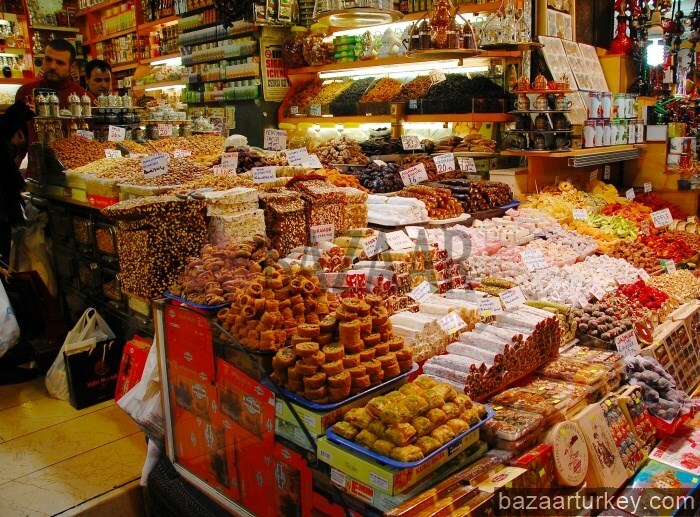 Travel to any town in Turkey and you are sure to find a tea house or a tea garden. In smaller towns and rural areas, tea houses are the preferred social hub where news and gossip are exchanged. In the larger cities and touristic regions, tea houses welcome the young and old, as well as many foreigners. Tea gardens, another social venue for drinking tea, gained popularity in the 1950s, especially in Istanbul, and were the place where families went for their social outings. It is important to note that the Turkish tea garden is very different from a Japanese tea garden. Whereas the latter is quiet and serene and was developed in conjunction with the Japanese tea ceremony, Turkish tea gardens are hubs of social activity with kids running around, music playing, and lively conversation among various groups from students, to businessmen to retirees and foreigners. Tea is at the nexus of many social events in Turkey. In rural areas the gelin hamami (bridal shower in a Turkish bath) features samovars of tea and pastries for the bride and her friends. The cay saati (tea time) is so important there are more than ten cookbooks devoted to the subject of sweet and savory pastries and light fare that can be served at this time of day. Turks prepare tea using a double tea pot. Water is boiled in the lower (larger) pot and the loose-leaf tea is steeped in the top (smaller) pot. This method allows each person to drink the tea as they desire: strong and steeped, or light with lots of water added. In central Anatolian towns such as Amasya, and in Eastern Turkey, tea is prepared in a samovar. 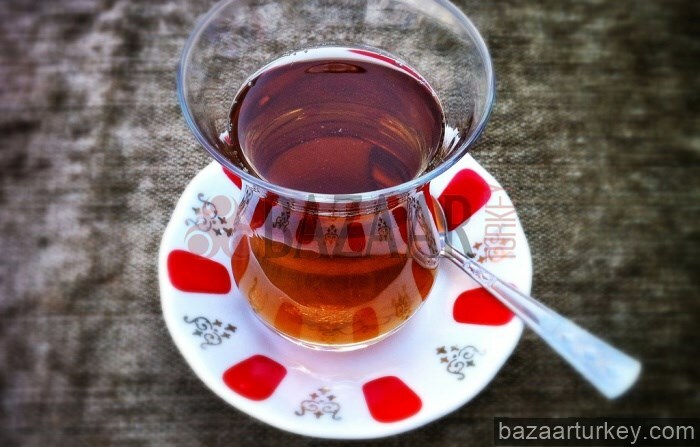 Turks prefer to drink tea in small tulip-shaped glasses. 400 million of these glasses, nearly six per person, are sold each year in Turkey. Though the origins of this shape are not known, the clear glass allows the drinker to appreciate the crimson color of the tea. The tea glass is so important in Turkish life it is used as a measurement in recipes. As you pass tea gardens and tea houses you will hear the clinking of tiny tea spoons in the tea glasses. In large cities like Istanbul, and the capital Ankara, tea may be served in porcelain cups and mugs as in England and the United States, but the small tea-glass is by far the container of choice. Generally, two small sugar cubes will accompany tea that is served in public. In Erzurum and other towns in Eastern Turkey, tea is taken in the kitlama style, where a lump of sugar is placed between the tongue and cheek. Turks never add milk to their tea; sometimes lemon may be preferred.